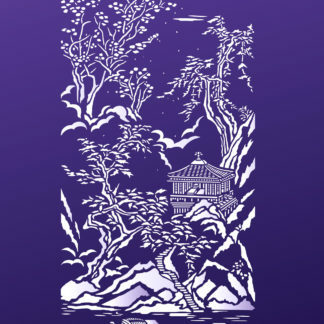 The Oversize Chinese Ravine Stencil is a beautiful chinoiserie style pictorial design showing a secluded mountain house, pine and blossom trees in a ravine above a lake and passing fishing boat. 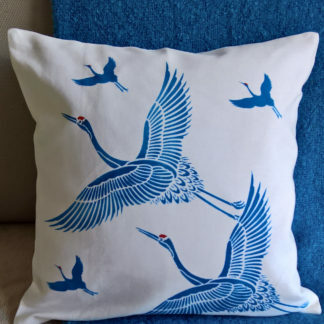 This designer stencil is ideal for creating hand printed feature walls and long silk panels, or for full length curtains or producing amazing oversize art on boards. Large 2 sheet stencil with registration dots for easy alignment of the two sections. See size and layout specifications below. 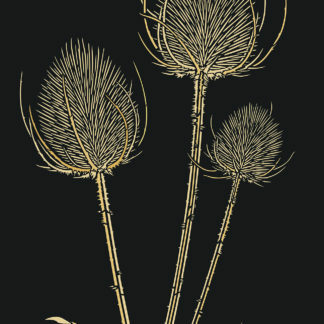 This design is stunning in classic white or gold on black or charcoal backgrounds, or black or white and gold on Chinese red. Or try lighter contemporary shades of greys, greens and blues. 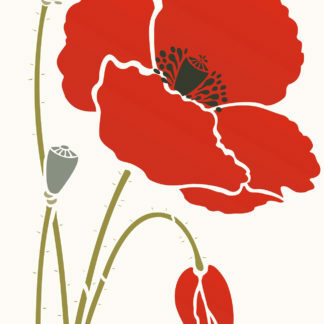 Also beautiful gilded with dutch metal or stencilled onto gilded surfaces. 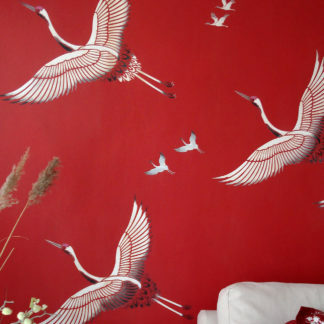 Above top – Oversize Chinese Ravine Stencil in Ice White, Nougat and Evening Primrose Stencil Paint on a Chinese red background. Above – close up detail of the Oversize Chinese Ravine Stencil in Very Berry Stencil Paint. 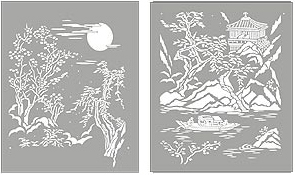 For this design on a smaller scale see the Chinese Ravine Stencil (single sheet stencil), as well as both the Small Chinoiserie and Large Chinoiserie Stencils. 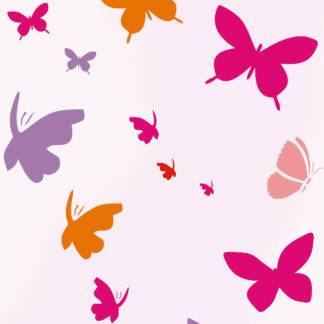 Stencil this design with our innovative Stencil Rollers – ideal for large and delicate stencils like this. 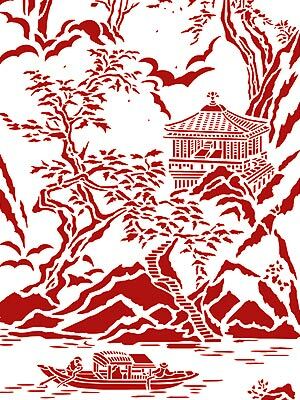 Above – the Oversize Chinese Ravine is used to create a paper wall hanging on bamboo poles. Duck egg coloured paper stencilled wtih Ice White and blushed with a little Orchid and Evening Primrose Stencil Paints, using Stencil Sponges. 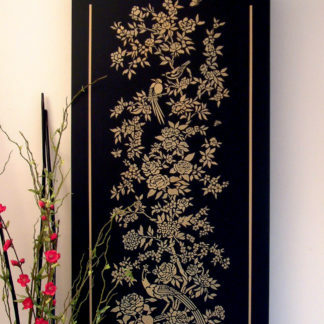 Above – Oversize Chinese Ravine stencilled in Nougat and Latte Stencil Paint and over-stencilled with Pearl and Antique Gold Metallic Stencil Paint on a dark charcoal background. 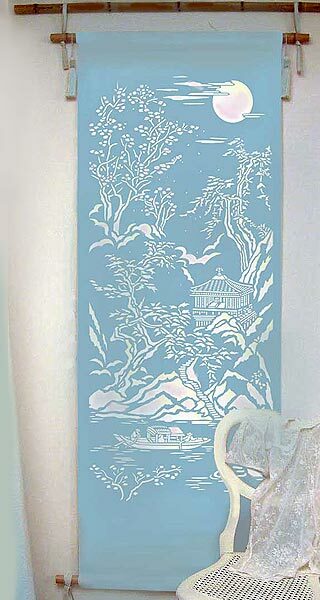 Above – Oversize Chinese Ravine Stencil in Ice White and Chinoiserie Stencil Paint, over-stencilled with Pearl and Silver Lights Metallic Stencil Paint on a chalky blue background. One layer stencil in two large sections that align vertically to create one large panel. 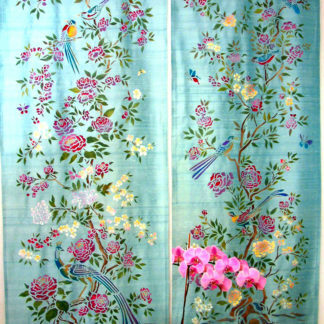 The height of the complete panel is approximately 168cm (66″) by approximately 56cm (23″) wide. Left – the two sections of this oversize stencil.